Being among the biggest names in the tech industry, Apple often has its new products held under tight scrutiny. There's certainly nothing wrong with that — devices that cost a premium price should have the chops to withstand criticism. Sometimes, there are legitimate complaints against the newest iDevice or Mac, sometimes not so much. 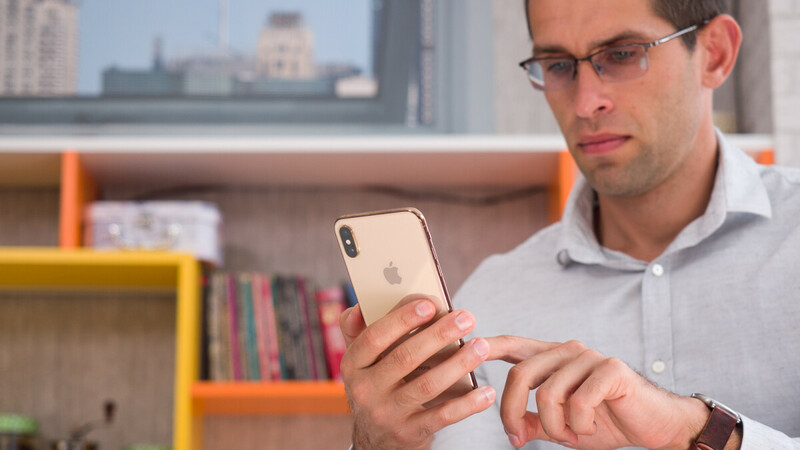 Here, we have a report of a lawsuit that alleges that Apple has lied about the screen sizes and resolution of the iPhone X, iPhone XS, and iPhone XS Max. It was filed just this last Friday in the US District Court of Northern California by two plaintiffs, but they are seeking class-action status since, you know — it supposedly affects all new iPhone owners. 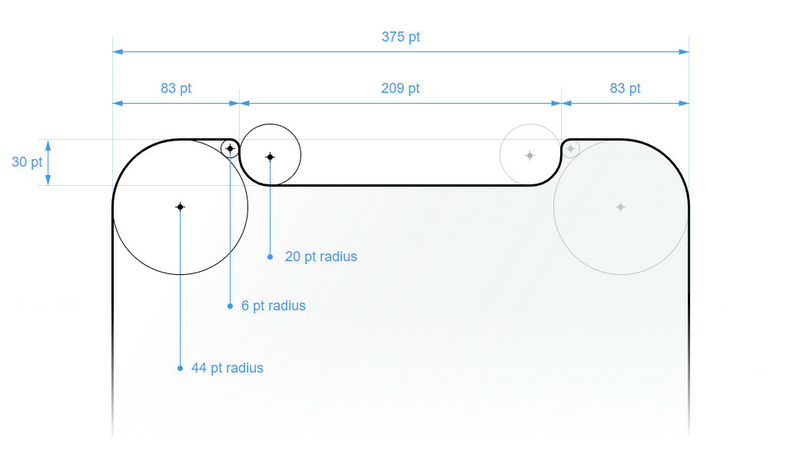 The suit points out that, when you subtract the area of the notch and the rounded corners of the iPhone X / XS / XS Max screens, you actually end up with a display that's smaller than Apple advertises. The iPhone X's screen is, in reality, not a 5.8-inch one, but a 5.68-incher, the lawsuit says. If you are interested in the math behind calculating the actual area these pesky cutouts steal from you — we covered it at length here. This is specified in a small footer in every iPhone XS page on Apple's website, so it's going to be a tough sell in court. Unless the plaintiffs have a specific situation with an Apple employee in a physical store insisting that the iPhone X has a 5.8-inch display, that is. Next, we have an interesting complaint — the plaintiffs say that the iPhone X and XS actually have a lower screen resolution than what Apple says. See, these new OLED displays that Apple uses now don't have your typical RGB subpixels to create one full pixel. Instead, each pixel only has two subpixels and they alternate — one will be Red and Green, the next will be Blue and Green. According to the plaintiffs, the fact that there are fewer subpixels on the screen is an actual lie about the overall resolution of the display. The new OLED panels in the new generation iPhones also happen to be made by Samsung. 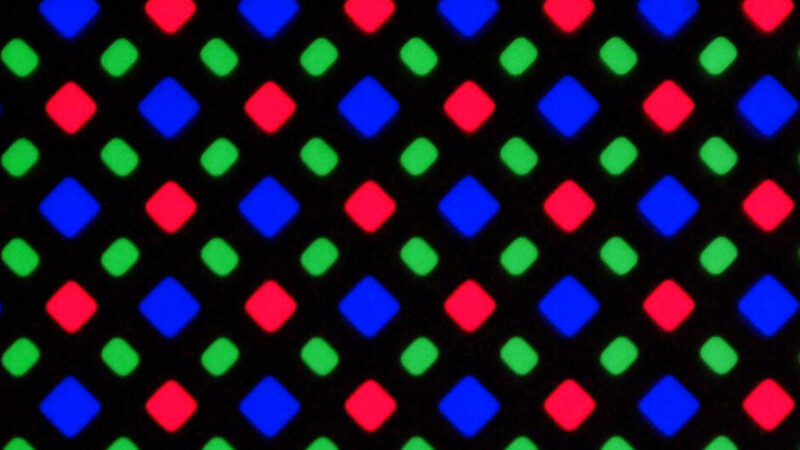 By placing the subpixels in a diagonal pattern and alternating Red-Green-Blue-Green, manufacturers can make OLED panels that draw much less energy than your typical RGB subpixel screen, and also end up with panels that have a much longer life. It is true that, since the subpixels are diagonally-placed and are shared between neighboring pixels, some tech pundits have called the PenTile pattern a "cheat"; a "not real" way to achieve a high resolution. It is also true that, in the lower-resolution screens of the past, there was a visible difference when comparing a PenTile matrix to a classic RGB one. Nowadays, phones have so many pixels crammed in their displays that it's hardly such an issue. But no rule or standard has been made to specifically state that RG BG pixels need to be counted as less than a full RGB pixel. In order to measure their resolutions, manufacturers use the standardized method by the Video Electronics Standards Association — line pairs need to have at least 50% of Michelson contrast (a 3:1 contrast ratio) between them. Also, despite still being Diamond PenTile matrix-based, Samsung's Super AMOLED screens are praised as the best in the industry nowadays. So... let's see how far this lawsuit gets! They are making money from the Apple's lies. He defend iPhone XS but said nothing about XS Max, even tough He show XS Max on 3rd picture. "When measured as a standard rectangular shape, the screen is 6.46 inches diagonally (actual viewable area is less)" It's marketed as 6.5 inch while actually it's less than 6.46 inch. Then, what about the other hundreds or thousands of iPhone X clones in the android world? Shall we prove the screen size and resolution is what they advertise? Of course it had to be filed in the US, the land of lawsuits. You can hate Apple all you want, but you can also pack that this is nothing but a greedy person trying to scam a company using the twisted laws find in the US. False advertsing is a twisted law now? Based on the rules of math, a number should only be rounded to its nearest whole number. "If" the display is 5.68", then it should only have been rounded to the nearest 10 in this case, making 5.7 to be legal rounded number and 5.8 simply is not. If you bought a TV, and you wanted a TV that was 55" advertised and you measure it and it was 53.8" , then you end up with a 54" display on that TV, not 55". If the measurement was 55.3", because that last digit is not higher than .5, then that means you round down. If it was 55.6, then you can round up legally to 56". But you cant lie and claim it 60". Yes in America you can sue for almost anything. I dont know what the exact size of the display is on the X and I dont care. But if it is actually 5.68", then it should be legally advertized as a 5.7" display which means it falls within the rules of rounding whole numbers. Claiming a display is 5.8" if it's less than 5.7" is a lie and they should be forced only to advertise it properly. But there shouldn't be any damages awarded, but Apple should be fined for false advertsing. As should anyone else. Do you know what a paragraph is supposed to look like? I have ZERO interest in arguing with a well known fanboy. Umm... Way before I bought the iPhone X I made a heavy research regarding the screen (size, actual veiwable area, screen size comparisons, resolution, physically handling the phone to get the feel and looks IRL). I read the post PA made about the real screen size of the phone the day they released it, so I always knew what I was going into. 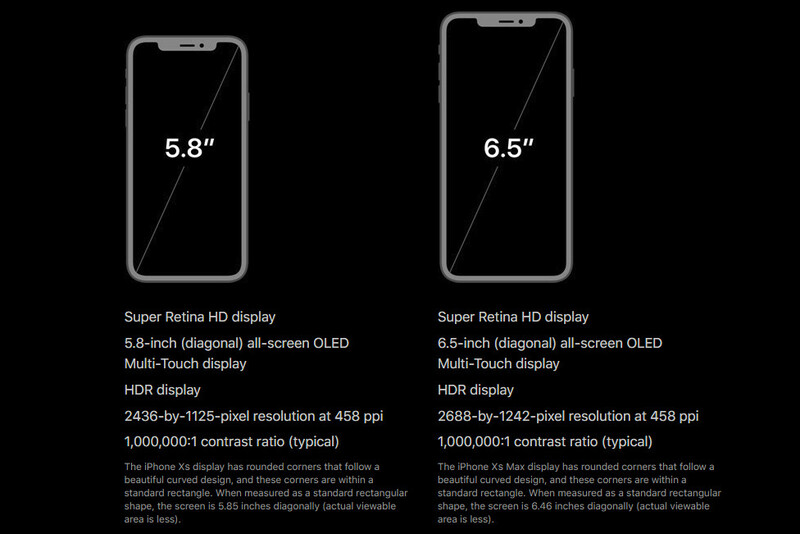 I'm fine with a slightly bigger screen with no effect on overall size of the phone, I'm not a fan of giant phones, the size of the X is just fine for me. I think this lawsuit is just to get back the $$$ they spent buying a $1K phone, the only thing I can agree is the false advertisement. Those things people do just to milk money from companies. Its from California...nothing surprises me from there. This is another stupid lawsuit. Maybe next they will file why apple doesn’t include the 3.5mm connector. Who ever own any iPhone that is included on this lawsuit will benefit if he win the case. At least we all found the truth what really the screen size we getting if u get iPhone x, xs,xs max. The false advertisement is very crucial and I don't know much about the law on that but making billions of $$$ money from it, will bit you in the @$& at the end. Do you believe in karma? Yes false advertising but how is it hurt you PHYsically for compensation? Hmmmm, just emotional distress. Dismiss, Judge said. When it comes to tech jargon, all the numbers you see as whole, are always rounded up or down. If the display is actually 5.68", then it should have not been rounded past 5.7" as a wnole number based on the rules of math. Claiming its 5.8 would be false advertsing and a lie. But the only thing the suit should do is make Apple not fudge the numbers to be unrealistic. But it doesn't hurt anyone in this case. APPLE is not advertsing a capability and the phone isnt living up to that standard. They are simply fluffing the numbers and that is illegal. If the display is 5.68, then yes that would also mean the advertised resolution is actually lower and the PPI would actually be higher. Because for each MM in size the screen is, it effects actually resolution and PPI numbers. You could honestly argue the same thing for any other notched phone. So, 1. The display is larger than Apple advertises it to be - a non issue. 2. Finally someone calls the bulls**t in the advertised ppi for OLED screens; there's no real problem with the phones, except that they are not all there; XS (Max) has only 324 ppi with all the pixels (which is a lower resolution than XR and way lower than 8+); I don't know the US laws and if this is going to be ground to convict Apple (and change the way all phone manufacturers report the numbers for their OLED phones), but I sure hope so.